I’m glad you could join me again for our exploration of Sculpture On The Way, a program of The Sculpture Foundation. Today, we’re going to finish up the remaining pieces, some of which are in places you may never have seen before. 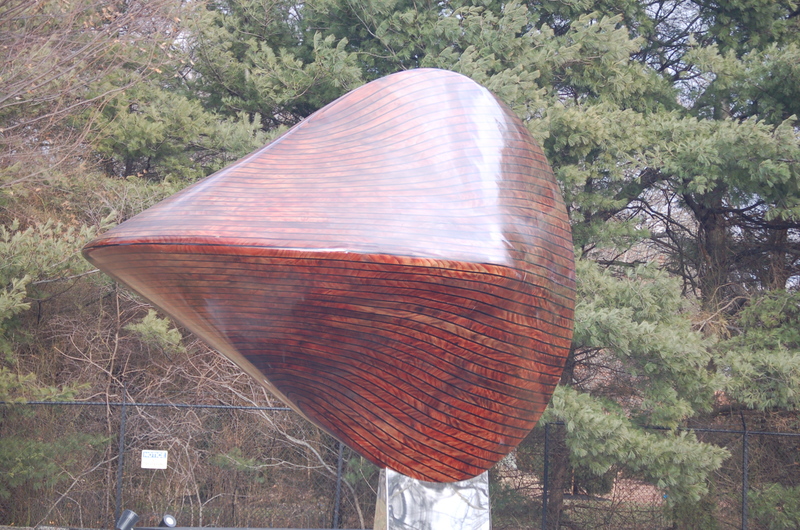 Across from Mr. Rat, which was discussed in the last episode, is Schatz’s Spaceship (Inspired by the Oloid) by Eva Calder-Powel who has several pieces in Sculpture On The Way as mentioned in earlier episodes. While my arithmetic is rather good, I must confess to a lack of knowledge of more advanced mathematics. But, since the full name includes it, I will attempt to describe an oloid. It is a geometric shape created by intersecting two disks of equal radius at right angles to each other. The distance between the centers of each disk is exactly equal to the radius. The name of the piece pays homage to Paul Schatz who created the oloid in the 19th century. While Shatz’s Spaceship appears to be made of wood and quite heavy, it is actually made of aluminum. Many, including me, have commented that it looks similar to the front end of an old ChrisCraft boat. Back when East State Street Extension was a bustling manufacturing center, ChrisCraft had a plant there making the seats and cushions that went into those elegant boats. Perhaps the artist and The Sculpture Foundation saw this piece as a connection to the area’s rich industrial past. We now move off the beaten path and go over to Klockner Road, near the intersection with Hamilton Avenue. In front of NottinghamHigh School is a sculpture by Mark Power called Long Forms. It’s made of bronze and appears as though it might be two fingers twisted together at the top, like crossed fingers. Although this piece is out of the way for most folks approaching Grounds For Sculpture, it is, nonetheless, part of Sculpture On The Way. About a block away, at the intersection of Klockner Road and Nottingham Way is Tulip by Seymour Ikerson. 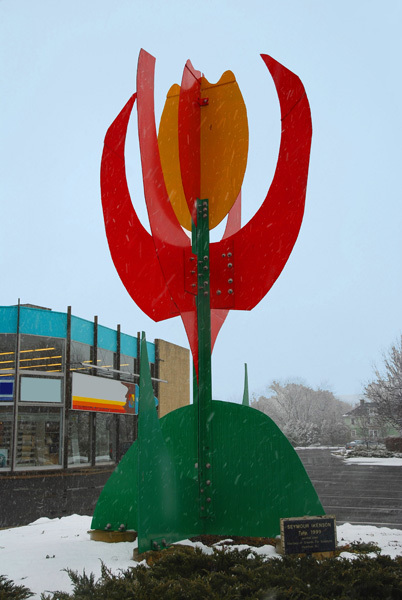 It was originally planted in front of a Siperstein’s paint store. That store has been razed and replaced with a Walgreen’s, yet Tulip remains. Most folks will approach Grounds For Sculpture via the Sloan Avenue West exit off I-295 (65B). Those who unquestioningly take the advice of their GPS devices will take exit 63, leading onto Nottingham Way. Although traveling this route will cause one to miss most of Sculpture On The Way, The Sculpture Foundation saw fit to install a few pieces for these folks to enjoy on their way. The first to be seen is Tulip. Ahead, about a quarter mile or so on the right hand side is Hitchhiker, another piece by Seward Johnson. It’s a realistic sculpture of a man standing on the side of the road with his thumb out and a hand lettered cardboard sign around his neck announcing his intended destination as Grounds For Sculpture. The realism in this piece is seen in the second photo where one can see the corrugations of the cardboard, yet this sculpture is made of bronze. It is the last piece, as of this writing, in the Sculpture On The Way series. I hope you’ve enjoyed our little chats on these awesome works of public art placed to whet the viewers’ appetites as they make their way to Grounds For Sculpture. These breadcrumbs have been scattered about to let you know that you’re getting close to your destination. But, they are more than that. As pulic art, they are there for the enjoyment of all who pass them each and every day or night. My last episode will look at why I undertook this project and I’ll share a few stories about photographing public art.